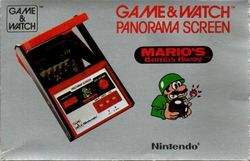 Mario's Bombs Away is a game for the Game & Watch released on November 10, 1983. 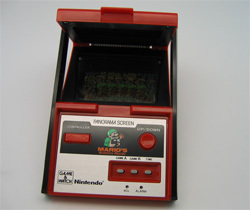 It was one of the six games made for the Panorama line. It was later rereleased in its classic form in Game & Watch Gallery 4. It can be played after the player collects 100 stars. The game involves Mario—a soldier in this game—on a mission to receive a bomb from his buddy on the left side of the screen and carry it to his troop on the other side. The enemy is waiting in the trees in his path, so he must keep his bomb away from their torches. One of his comrades is the Heavy Smoker, who is a slacker that carelessly tosses burning cigars into a stream of spilled oil, so he must also keep it from igniting on the ground. Mario earns a point each time he advances a step to the right while carrying a bomb. When he reaches the other side, he must carefully pass the bomb to his buddy, who will toss it onto one of the five trees, giving Mario five points. After five bombs are tossed onto the trees, they will explode on the enemy, rewarding Mario with 10 points. As time passes, the torches and the fire on the ground will move faster. In Game B, more enemy torches appear, and the game gets faster sooner. If Mario's bomb gets lit, he will retreat to his outpost, where the bomb will detonate in his face and blow up his outpost, earning him a miss. If Mario reaches 300 points without any misses, the points will be worth double until he does get a miss. If he has any misses at said score, every miss will be cleared instead. The game ends when he gets three misses. True to the game's wartime jungle setting, there is an alarm monkey serving as this unit's time function. Given the Jungle setting and the style of uniforms that Mario and the other soldiers are wearing, the war in question was presumably the Vietnam War. This page was last edited on April 8, 2019, at 00:25.